Shawn Mendes wants to heal the world through his music. In three weeks, the pop singer will release his self-titled third studio album. Earlier this morning, Mendes premiered "Youth" exclusively on Apple Music's Beats 1 with Zane Lowe. Mendes had been teasing the song through a global outdoor campaign across Berlin, Chicago, L.A., London, Melbourne, Miami, Washington D.C., New York, Rio, Stockholm and Toronto. The album's lead single, "In My Blood," peaked at No. 22 on the Billboard Hot 100. The 19-year-old singer-songwriter also dropped "Lost in Japan" as a pre-release single—one of 14 album tracks. Mendes teamed up with five-time Grammy Award nominee Khalid for "Youth," and the duet is a tribute of sorts to the victims of last summer's bombings in the U.K. "I've known Khalid for about maybe a little over a year now. We just immediately hit it off. It's just a really, really awesome friendship—like, talking all the time," Mendes said. "When things first really started happening for him, we were always like, 'We've gotta get together! We've gotta make music!'" Would Shawn Mendes Ever Date a Fan? When a bomb was detonated at Ariana Grande's Manchester concert in, Mendes happened to be in London. "There was the attack on the bridge, and I remember that day thinking, like, 'OK, I gotta text [Khalid],'" he recalled. "When I texted him, I said, 'When we get together, we have to make a statement. We have to move. We have to write about what's going on in life and how the youth is feeling because I think we have the voice to do that.' We got together that day and I was like, 'This is a huge task.' Because you're always terrified going into a session knowing like, 'OK, this is going to be a big session. I have one day. Is it going to be the greatest song or not?'" "I remember I woke up in the morning and the whole thought of my youth trying to be taken away from me [was overwhelming]. Not youth as in my age—youth as in my love, my happiness, my joy, my purity. It's not even about age; you could be 50 and your youth is there. It's in you. And all of these horrible things happening in the world, all of the headlines, it felt like every day it was just being pulled more and more out of us," Mendes explained. "I was like, 'This is what we have to write about.' And It was awesome. I'm really, really proud of the song." Writing "Youth" was "so hard," Mendes confessed to Lowe. "It's so easy to sit at a piano and talk about being in love or heartbreak or something, but the hardest thing in the world is to sit at a piano and talk about what the world is going through, and heartbreak, in a different light." When E! 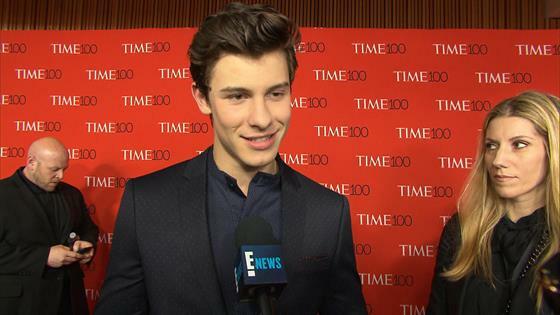 News caught up with Mendes at the TIME 100 Gala in New York City last week, he said, "The first couple singles are a huge contrast from each other. One's rock and one's more on the R&B side. It's kind of how the entire album is; it's a hybrid of music in a really cool way."